Next week, PRI will host a breakfast briefing to present analysis of global crime trends and the use of imprisonment, including emerging issues and challenges, from the Global Prison Trends 2017 report. 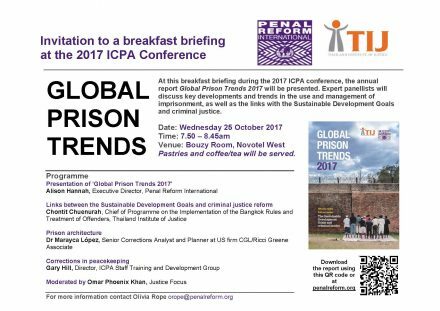 The briefing, which will take place on Wednesday 25 October at the ICPA 2017 conference in London, will also look at the contribution of criminal justice reform to achieving the Sustainable Development Goals. Speakers at the briefing will include PRI’s Executive Director Alison Hannah; Chontit Chuenurah of the Thailand Institute of Justice; Dr Marayca López, Senior Corrections Analyst and Planner at US firm CGL/Ricci Greene Associates; and Gary Hill, Director of the ICPA Staff Training and Development Group. Omar Phoenix Khan of Justice Focus will moderate the event, which will take place at the Novotel West Hotel, London, from 7.50am. Global Prison Trends 2017 is the third in a series of publications by PRI, which aims to fill a gap in the analysis of the use and role of imprisonment globally. The 2017 edition is co-published with the Thailand Institute of Justice (TIJ). This year’s Global Prison Trends report dedicates the Special Focus section to the links between the Sustainable Development Goals (SDGs) and criminal justice reform, not only on Goal 16 (which, for the first time, links sustainable development with justice, rule of law and transparency), but also other goals including those on poverty, inequality, health and education. Click here for full details on the breakfast briefing. Download Global Prison Trends 2017 here.